Workplace Bully and Corruption Whistleblower: Workplace Bullies, Public Trustee, Corruption, Workers Rights, and the Rann Wagon Train. Workplace Bullies, Public Trustee, Corruption, Workers Rights, and the Rann Wagon Train. 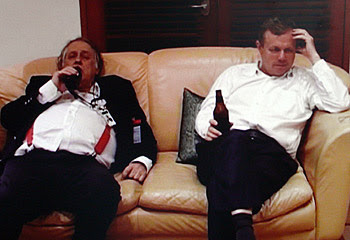 I have been criticised for my constant bagging of the South Australian Government, currently led by Premier Mike Rann. Not the one on the left. My persistent criticism is easy to explain. For 9 years, when I worked at Public Trustee, I battled the bullies and the corruption that made my life a bloody misery. And what did the Rann Government do? NOTHING!!!!!! Ever sent someone a simple Email, and you know how quick and easy it is to CLICK the REPLY button? Even just to say 'get back to you on that '? Weeks pass, months pass, then years passed, persisting with follow-up Emails, letters and telephone calls.....and still nothing? I didn't go away!!! Had to resort to the Equal Opportunity Commission. Jan McMahon's union the PSA (that was a bloody joke), The Equal Opportunity Tribunal in the District Court. The State Ombudsman. Anti-corruption branch of SAPOL. Politicians. The media...and that was my undoing. The Government unleashed its internal investigators and accused me of breaching the Public Service management Act. Within 2 weeks of appearing on Today Tonight. But hey, why not ignore my years of whistleblowing when its directed at the top of the totem pole! NINE YEARS of nothing. I think the picture tells the story. There is something radically wrong with the way in which this state is governed. If we can build submarines, why can't we build bloody trams! Why does the Government flog off buildings without a public tender...25 Franklin! Why no Independent Commission against Corruption! Why did the sale of a government building involve Spain! Why did the design of the yet-to-be-built warships involve Spain! Why does the construction of the desal plant involve Spain! Why are we going to buy 6 trams out of.........Spain! Why does the Premier want to eradicate the Upper House. I do not profess to have spectacular answers. Only speculation. And with a Government so hell bent on secrecy, I can only speculate, along with 100% off the people I know, all in agreement. I was wronged. No doubt about that. My job is gone. My Career is stuffed. My health in tatters. I just pick up the pieces. And you, Mr Premier, and 99.9% of those below you, NEVER GAVE A STUFF!!! Trouble is, Premier Rann, when you turned your back on me, and you and the Attorney-General Atkinson, in writing, demonstrated that you didn't give a toss about your Duty of Care, you my friend created a Northern Irish radical Eureka Stockade-inspired nitpicking pain in the arse monster that will thunder along next to your wagon train......all the way! Yep, the picture says it all.